Revenue in FY2017 1Q were ¥232.4 billion. This outcome represented a small increase of 1% year on year. 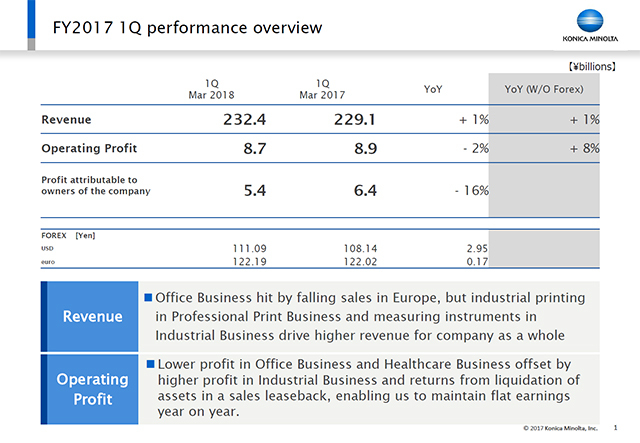 A detailed explanation by business will be provided on later pages, but although the Office Business, and Materials and components recorded lower revenue, other businesses posted higher revenue and, in particular, the measuring instruments business unit of the Industrial Business posted significantly higher revenue. Operating profit was ¥8.7 billion. Office Business profit fell by ¥6.1 billion and Healthcare by ¥0.7 billion, but due to the combined effects of the ¥2.7 billion increase in profit in the Industrial Business and ¥4.0 billion in measures taken to liquidate assets by sale & leaseback, profit came in at roughly the same level as that of the same period of the previous fiscal year.